We’ll visit my novel, THE CITY OF ROCKS, for today’s post in order to return to what I always intended with the blog: to highlight places of interest in the great State of New Mexico. And the little border town of Columbus is unique among them. As our intrepid Confidential Investigator, BJ Vinson, speeds down the highway on the way to the town, he reviews some of the history of the place. The following scene takes place in Chapter 4 of the book. The actual story is long and convoluted, as well as highly controversial. Two revolutionaries, Venustiano Carranza and Francisco Villa, better known as Pancho, tossed out a dictator named Victoriano Huerta and then turned on one another. 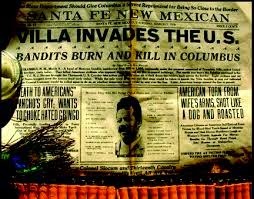 A Columbus merchant and arms dealer by the name of Ravel supposedly sold defective ammunition to Pancho Villa. When the guerilla demanded a refund, the merchant reputedly told him the Ravels no longer dealt with Mexican bandits. On the morning of March 9, 1916, one of Villa’s generals attacked Columbus with more than 500 men. The twenty-four-hour invasion burned down a significant portion of the town and killed fourteen American soldiers together with ten residents. Another eighty or so revolutionaries were dead or mortally wounded. The raid led let to General John J. Pershing’s Punitive Expedition deep into Mexico. In his brief, overnight stay there, BJ takes time to visit some of the historic relics, including Pancho Villa’s death mask, before departing for the M Lazy M Ranch. I hope you enjoyed this abbreviated look at the border village of Columbus, New Mexico. Keep on reading, guys.